The Amtrak Downeaster travels through Portland in December 2011. 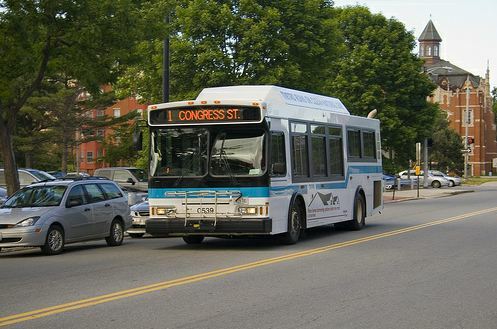 This University of Southern Maine photograph depicts a greater Portland METRO bus headed for Congress Street. U.S. Rep. Chellie Pingree, D-Maine, said Wednesday, June 27, 2012 that a population cutoff provision in federal transit funding threatens the METRO. PORTLAND, Maine — More than $1.3 million in yearly federal funding to help operate the Portland area METRO buses could be cut off if the highway bill facing Congress this weekend doesn’t pass, U.S. Rep. Chellie Pingree said. 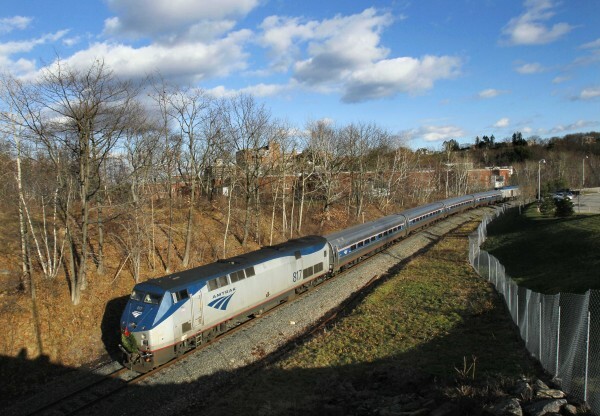 The highway bill also includes crucial funding for the Amtrak Downeaster train, which connects Portland to Boston. Because the population of Greater Portland — defined by the U.S. Department of Transportation as everything from Arundel to Freeport — exceeded 200,000 in the latest U.S. Census count, the local METRO bus service no longer qualifies for the transit funding, Pingree said this week. Pingree said she supports a provision in the highway authorization bill that grants an exemption to the population killswitch for systems with fewer than 100 buses. The bill is slated to be taken up by the House and Senate either Friday or Saturday. The Greater Portland Transit District METRO claims an annual ridership of 1.4 million along eight fixed routes. The METRO fleet of approximately two dozen buses includes seven diesel buses and 13 compressed natural gas buses. According to the METRO’s 2012 budget, the service receives about $1.32 million in federal operating subsidies each year. The municipalities of Portland, Westbrook and Falmouth contribute a combined $2.9 million for the regional bus service, while passenger fares account for another $1.8 million in revenue. The METRO’s expenditures for 2012 were slated to be slightly more than $6.4 million. The highway authorization bill also includes $6 million in Congestion Mitigation and Air Quality — more commonly known by the acronym CMAQ — funding for the popular Amtrak Downeaster train which connects Portland to Boston. The Downeaster has used annual allocations of CMAQ funds since its beginnings in 2001, despite a three-year limit included in the program, because Amtrak was granted yearly exceptions to the cap by Congress. This year, the Downeaster’s CMAQ exception was not included in the House bill — despite support for the allowance by Pingree and fellow Maine Democrat Mike Michaud — triggering Amtrak officials’ concerns. However, the exception was included in the Senate bill with the support of U.S. Sens. Olympia Snowe and Susan Collins, and it survived the reconciliation of the two chambers’ bills during the conference committee process. As a result, the $6 million in CMAQ funding for the Downeaster will be provided with the passage of the overall highway authorization bill by Congress when it votes Friday or Saturday.